CCTV Camera Pros provides the following instructions for our JP Surveillance DVRs incase you need to install or replace a hard disk drive. Please follow the below instructions to install a new hard drive into your surveillance DVR. Please note that you should first contact CCTV Camera Pros if you believe that your hard drive is not working properly before you open up your DVRs case. It does not happen often but from time to time hard disk drives do go bad like any other electronic component. We also provide instructions below on adding a second hard drive to you surveillance DVR. Please follow these instructions to replace the hard drive in your JP surveilance DVR. Using a small phillips head screw driver, remove the 8 screws that hold the top cover in place on the DVR. There are 4 screws on the top of the unit and 2 screws on each side. After you remove the screws, the cover of the DVR should easily slid off. Unscrew the hard drive from the DVR by turning the DVR on its side. There are normally 4 screws holding the hard drive to the bottom of the DVR case. When you get to the last screw, be sure to hold the hard drive so that it does not drop. Attach the new hard drive to your DVR using the same screws that you removed the old drive with in step 3. Attach the power and SATA cable to the back of the new hard drive. Install the DVRs cover back into place. Re-attach your DVRs power supply and monitor. Boot up your DVR and allow the DVR to fully initialize. When complete login to your DVR by pressing the menu button on the DVR or the remote control and enter your password. The default password is blank (just press OK). Select Configuration from the System menu. Select HDD Management from the Configuration menu. Select HDD Setup from the HDD Management menu. Your DVR should be displaying "Change HDD" next to the HDD Status. Select HDD Clear and press Enter or OK. If successful, you will be brought back to the HDD Setup screen and the HDD Status will now say "Empty". Press the Menu button on your DVR several times until you exit completely out of the menu system and see your security cameras. Test that your DVR can properly record by pushing the record button on your DVR or remote control. Let the DVR record for at least 10 seconds. Press Stop on the DVR to stop recording. Press the Search button on your DVR or remote. Select Search Bar from the Search menu. Press Enter on the Search Bar screen. Your DVR should begin playing the test video footage that it just recorded. CCTV Camera Pros JP surveillance DVRs support up to two hard drives. Each drive can be up to 750 GB in size. 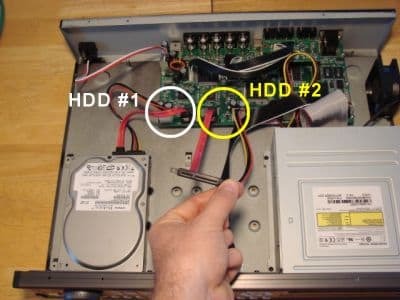 Follow the below instructions to install a 2nd HDD into your DVR. Mount the second hard drive in the 2nd bay / port of your DVR. 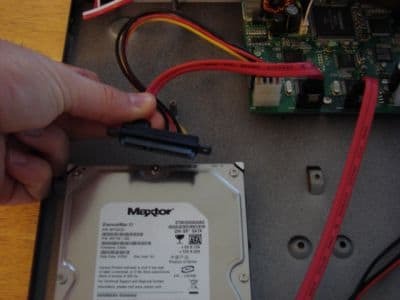 You will find an extra SATA HDD connector already attached to the second port of the DVR. Please see the image below. After you attach your HDD to the DVR case, attach the SATA cable to the hard drive. When you are done, you can put the cover back on your DVR and secure it with the screws. Re-attach the power of your DVR, the BNC connections to your cameras, and the monitor. Press the Menu button to go back to the HDD Management screen. Select HDD Information. You should now see a Master-1 and a Master 2 Hard drive listed on the HDD Information screen.